It is highly recommended that your water heater is mounted on a stand. All Loheat water heaters are fitted with integral flanges only to tie the units back to the wall for added security. These flanges are not designed to support the weight of the heater for wall mounting. We advise the use of these strong galvanised stands to both increase the effectiveness of your water heater and prolong its life. Safely elevating the heater to the required / optimum level, the stand also distributes the weight of the heater over the entire base, preventing any warping or bowing that can occur when heaters are supported on bricks or pillars. All stands are supplied in flat pack kit form for easy self assembly, which only takes minutes. Don't forget all heaters are gravity discharge, so the outlet needs to be higher than the wash trough or sink. 16 gauge steel tray to fully support the base of the water heater. 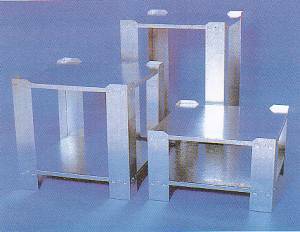 14 gauge steel legs for compressive strength. Folded back foot pattern for high load bearing. Loheat special leg clamping flanges for rigidity. Handy storage tray for above floor storage of chemicals etc. Available in 3 heights for every size of heater. Easy assembly with no specialist tools required. All stands are carriage free if ordered at the same time as a water heater. Click here to be taken to our secure site to purchase your Loheat Water Heater Stand online. You can also phone, fax or skype your order through to us. We can usually dispatch the same day as we receive your order.